Peggy and Tim – Home Buyer Clients in Hudson, WI made an offer to our seller client on their one level town home. We worked with both buyer and seller to negotiate a favorable deal for both parties. SIGN UP TO EMAIL ALERTS WHEN NEW LISTINGS HIT THE MARKET! Homes are selling fast and and home prices in Hudson are rising. There are many reasons for this. Home owners are simply not putting their homes on the market. Mortgage interest rates are rising. Many Hudson home owners refinanced in the past few years and are locked in to a really great interest rate. With the rise in mortgage interest rates we have already seen this year, it’s suspected that many home owners are deciding to remain in their current homes to avoid a higher interest rate on their next home mortgage. However, interest rates continue to be at historically low levels. Home owners are more cautious to upsize after the recession. Some home owners struggled financially during the recession (some losing their homes to foreclosure) and are determined to be content to stay put in their home, even when a home no longer fits their lifestyle. Seniors are aging in place. Many seniors are deciding to stay in their home as they age, choosing to make modifications to the home and make lifestyle adjustments that allow them to remain at home. Home builders can’t keep up with demand. We’ve got a huge shortage in construction labor, causing a major slow down in new home construction in the Twin Cities (Star Tribune). Adding to the home shortage is the fact that profit driven builders want to build more expensive, upsized homes, leaving first time buyers with smaller budgets with limited options. Multi-unit homes (town homes and condos) are good options for first time buyers and downsizing baby boomers and seniors, but if you want a modestly priced single family home, you’ll need to look at pre-owned homes. Young families, couples and even singles are ready to buy! Interest rates are still historically low, rents are going up, and home ownership is a great investment. Retiring baby boomers are looking for one level living near family and activities. Companies are recruiting from outside the area, so families are relocating to Hudson, WI. Families are prospering and growing and want a bigger home or more property. Be available to view homes. Be ready to make buying decisions quickly. Be prepared for multiple offer situations – it’s likely you will encounter one. If you are considering selling a home in Hudson, now is a great time to list your home for sale! 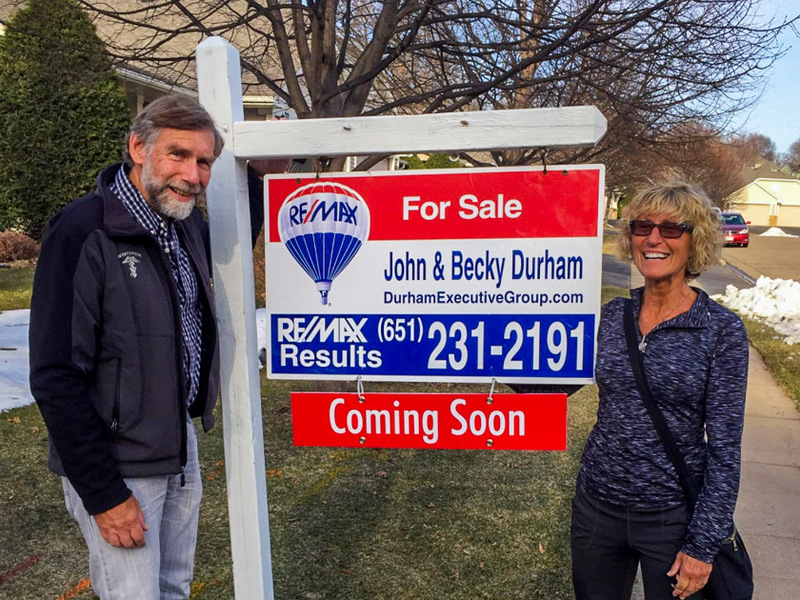 The John and Becky Durham are realtors with REMAX Results in Hudson, WI. They are delighted to work with home buyers in all price points. We love living in Hudson, WI and would be delighted to show you around. If you are considering moving to Hudson, contact us today! Watch or video to learn more about relocating to Hudson, WI.